Scanpan Classic is Scanpan’s original range of quality Danish cookware. It’s got ergonomic handles, a non-stick ceramic titanium cooking surface, it’s easy to clean. If your kitchen is your favourite place in the world, then you’ll love working with Scanpan Classic cookware. It’s perfect for the kind of everyday cooking that you love so much. You know what they say – don’t mess with the classics! Cookware body made from pressure-cast aluminium, with a thick base for optimum heat conductivity. Tagine cover made from glossy white ceramic. Tough ceramic titanium non-stick cooking surface is guaranteed against blistering and peeling when used correctly and is even safe to use with metal cooking utensils. Bakelite handles are ergonomically designed, and guaranteed never to come loose, thanks to Scanpan’s patented screw and rivet free handle assembly. 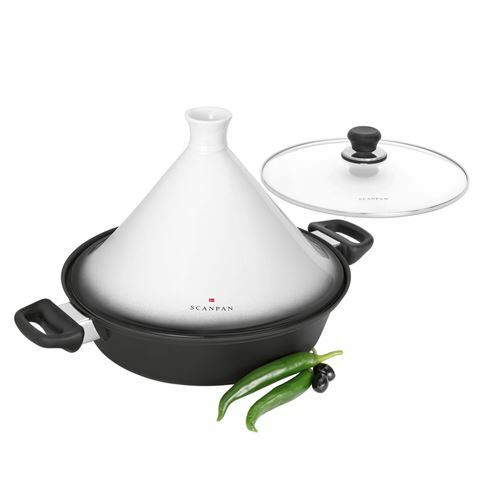 Includes a lid, made from tempered glass that can be fitted on the Tagine base. Presented as a set in a Scanpan box. Energy friendly – low to medium heat required only. Easy to clean, non-stick surface may be scrubbed with a scourer when required. After cleaning, dry and rub a little oil onto the non-stick surface. This will help the non-stick surface maintain its non-stick properties for even longer.